The Interagency Thematic Scientific Digest «Viticulture and winemaking» is a periodical professional scientific and theoretical publication, which covers the innovative, organizational and methodological aspects of modern science of grapes and wine; theoretical bases and practical recommendations of scientific support of breeding and variety study, results of study of new perspective grapes, their adaptation to unfavorable environmental conditions with the purpose of increase of productivity and improvement of quality of grape and wine products are determined; modern resource-saving technologies of soil cultivation of vineyards are presented. ISSN: 0372-6304 «Viticulture» (1964-1969 years) – the original was published only in Russian. ISSN: 0135-2350 «Viticulture and winemaking» (1969-1995 years) – the original was published only in Russian. 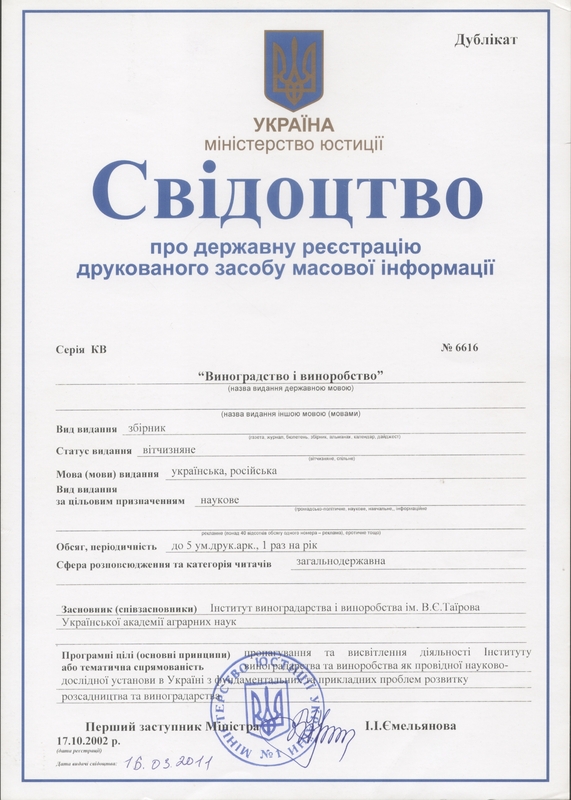 ISSN: 0372-5847 «Viticulture and winemaking» (since 1995) – the original is published in Ukrainian and Russian. The founder of the Interagency Thematic Scientific Digest «Viticulture and winemaking» is the National Scientific Centre «V.Ye. Tairov Institute of Viticulture and Winemaking» NAAS of Ukraine. In the digest are published scientific articles, review articles, reviews, information, as well as discussion materials. The Interagency Thematic Scientific Digest «Viticulture and winemaking» is published in Ukrainian and Russian. The materials of the digest are addressed to scientists, graduate students, undergraduates and students of agricultural universities, specialists of vineyards of the wine-growing and wine-making industry of agro-industrial complex. 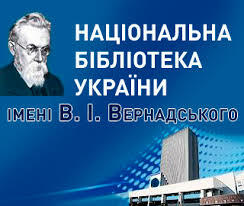 The digest is published and distributed through the Internet on the basis of the decision of the Academic Council of the National Scientific Centre «V.Ye. 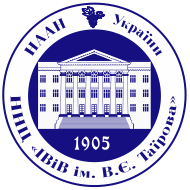 Tairov Institute of Viticulture and Winemaking» NAAS of Ukraine.